I arrived in Kabul in the evening of the 27th after being delayed by bad weather. So I started my trip with bad weather and delay and ended with bad weather. I took 18 cartons of materials with me, filled with 5 computers, 5 sewing machines, telephones, clothes, and microscopes. Malaysia Airlines didn’t charge a penny for this, but Ariana charged $450 (which actually included a good discount). After visiting HOOWA's carpet weaving and literacy classes, I opened two more literacy classes and two sewing classes. We bought 40 sewing machines with all the necessary accessories and fabrics and hired professional teachers. I distributed food to 82 widows: 50 kg of rice, 50 kg of flour, and 5 kg of cooking oil. 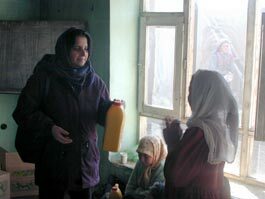 Fahima distibuting cooking oil to widows and their families in Kabul. I visited literacy and vocational classes run by HAWCA and RAWA. At HAWCA's school, we distributed cooking oil to over 240 destitute students. I also took a young girl to the doctor who is losing her nails and part of her fingers to some disease. One of RAWA's sewing classes was held in a garage, where it was so cold that the women's hands were blue. I paid for a wood burning stove and some school materials for them. Since they had only three borrowed sewing machines, we got them 18 more and a lot of fabric. I went with a team of doctors to Istalif, an hour north of Kabul, to help as a dental assistant and interpreter. I didn’t mind interpreting, but assisting in surgery was very unpleasant. We also distributed enough food for one month to 22 widows in an area called Taimani. In Karabagh I distributed winter clothing and money. Once 2000 families lived in this village, but the Taliban and jihadis reduced them to 100. The Taliban burned down their vineyards and houses and killed many males. The area was famous for vineyards, and families used to cultivate 400- 5000 grapevines, but now only a few families have vines. I gave widows and few desperate individuals who are taking care of some orphans between 500-1000 afg ($12-$26; 500 afg will buy 100 vines.) We also distributed 3-4 pieces of winter clothing to each family. This was during Ead, and people told me it was the first real Ead for them in a very long time. On the fourth day of Ead I visited another income-generating project run by an old friend from school, whose work is inspiring. The group is not a registered NGO and has no outside support. They raise money by selling their crafts. Many students were absent because of the holidays, but the teachers came to see me. They were eager to open literacy classes. I give them money for rent, salaries, and supplies for 5 literacy classes for 3 months. I also bought school supplies for 120 students. We have to raise more money to keep them going for 6 more months. In Kabul I debated whether to fund a project of AOHREP (Afghanistan Organization of Human Rights and Environmental Protection). We’ve been receiving AOHREP proposals for a long time, and Mr. Hotaki, the director, has been pleading for money. I have just sent him $2000. Let me tell you that if someone really wants to help, $29,000 (which I had with me) goes a long way. There are NGOs who get big money, but by the time their money gets to the needy, it has shrunk tremendously. Anyone who is going to Afghanistan is welcome to see our work. I want to say that I have not done this alone. It was and is a joint effort. I thank all WAW sisters (and some brothers) for their help and support. I also want to thank Alicia Lucksted for helping me pack and raise money. My goal is to raise $50,000 between now and June. Of course you will help me. Thanks for your commitment and dedication to this noble cause.